Even while soaring on cloud nine with series of successes, a company’s morale takes a nosedive when it can’t stick to its basic vow of managing waste in the office. In this increasingly digitalized world, improper paper management still poses as an alarmingly big problem. Recent studies have revealed that every year corporate offices dispose of more than 350 pounds of paper per employee. That is quite an unnerving fact by itself! However, the truth that very few firms are even concerned about this and are hardly doing anything to improve the situation is even more saddening. This indifference of corporate firms and that too amongst the constant talks of going green and saving the environment is rapidly making the situation worse. What is interesting is that these firms often fail to understand that these waste papers are also causing them a significant loss of money. More than intent, the problem seems to be ignorance. People are so used to working with paper all the time that even after being surrounded by various types of computers, they feel lost when that paper book is taken away from them. They do not know how to go about saving paper and many do not even believe that it can be done. Fortunately that does not change the fact that saving paper is not here to be just a pipe dream. That it can be done has already been proven by Bank of America in 1994 by saving more than $1 million over the course of a year, which would have otherwise been used on paper purchases. 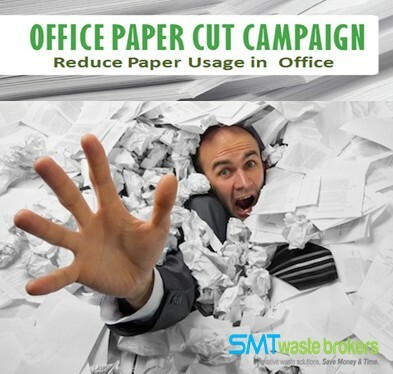 Put in motion a paper reduction campaign – Let your employees know that you value the reduction of paper usage. Guide them with certain steps that they can take to actually start the process after you have made the announcement. Put up signs as reminders to conserve paper. Implement double-sided printing – Why leave one side of the paper absolutely blank when it is perfectly fine to use it? Whenever a document is being printed, which is almost always, employees must remember to use the other side of the paper too. Make used of already used paper in the office – With so many papers with only one-side prints lying around, try to make use of the blank side as notepads, or test page or rough drafts. Promote in-house emails – There is no need to send in house memos when the purpose can be served by simply sending emails. This will take a bit of time for getting used to; but will yield good results. Recycle paper – For recycle purposes, collect all wasted paper at one place rather that leaving them sitting here and there. Educate the staff about how paper can be easily recycled to benefit both the company and the environment. While it might take a considerable span of time, these steps collectively will yield positive results, both environmentally and financially!